What are they and how can we deal with them? 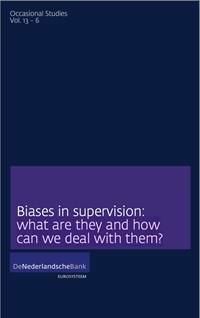 Biases in supervision: what are they and how can we deal with them? According to this report, financial supervisory authorities placed too much confidence in mathematical models that purported to predict how the financial sector and risks would develop. Put simply, this led supervisors to use incorrect assumptions, leaving them unable to anticipate financial risks and the consequences for the sector. The demands placed on supervision should not be underestimated, however. Indeed, as the IMF notes, good financial supervision is intrusive, sceptical but proactive, comprehensive, adaptive and conclusive. The Financial Stability Board (FSB) explains that supervisory authorities ‘exist for the purpose of always having a reasonably accurate assessment of the delicate balance between the risk taking of a financial institution and an appropriate level of capital available to absorb unexpected losses and intervening early when there is an imbalance’. These expectations imply that supervisory authorities are rational and predictable institutions and that they are able to make judgments and decisions in an objective, consistent and decisive manner. Of course, supervisors have not always been able to fulfil these expectations and some observers doubt they will be able to do so in the future. In that respect Luyendijk writes that not enough has been done to tackle the problems in the financial sector and that nothing has changed. This study looks at why supervisory authorities may fail to see risks, underestimate risks or fail to take action to mitigate risks. This is not necessarily always due to a lack of expertise, professionalism or knowledge. Psychological processes can undermine the effectiveness of supervision without the authority being aware of this. So called biases influence the effectiveness of supervision, by having an impact on decision-making processes and judgment. to include systematic errors due to cognitive factors rather than actual evidence. Biases influence the way in which people make judgments and therefore influence their actions. Everyone is affected by biases to a greater or lesser extent. The starting point for this study is that supervisors working at supervisory authorities are also – or, perhaps, particularly – affected by biases. Supervision is potentially less effective as a result. It is important that individual supervisors are aware of their biases (and those of their colleagues) and that they think about strategies for reducing biases so that impact of biases on the effectiveness of supervision can be minimised.